"The book starts with a brief history of the game, the rules, and an explanation of backgammon notation. Early tips tell beginners how to run, hit, block and prime. This is a practical rather than a theoretical book. A good introductory book for someone new to the game. 44. Diversify Your Good Numbers. 52. Clear from the Back. COVER: Backgammon has been described as "the perfect combination of skill and luck". 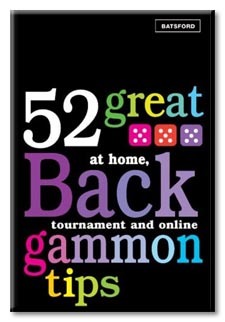 This invaluable book contains 52 essential tips to help you improve your game, whether you are playing in organized tournaments, online or simply around the kitchen table at home. and cover many other topics, including the doubling cube and the Crawford rule, accompanied by clear illustrations of set positions. This book contains anything you ever wanted to know about backgammon, and more. AUTHORS: Kit Woolsey is a well-known backgammon expert, theorist, and winner of countless tournaments. He is also the author of ground-breaking books on backgammon: New Ideas in Backgammon and How to Play Tournament Backgammon. Patti Beadles has been playing competitive backgammon for over a decade. She runs the website FIBS, the longest-running backgammon server on the internet.